Earth (Terra) is our planet. This is the third farthest planet from the Sun after Mercury and Venus but closer than Mars. 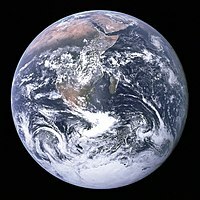 A Computer Generated photo of what the Earth would look like from high orbit. This page was last edited on 30 December 2018, at 15:12.